White lost the fight in the upper left corner. There is no compensation anywhere for the ponnuki that Black obtained. The ponnuki does not seem a big deal but in fact it has a very big significance in the further flow of the game. Note that throughout the game in a furious fight the black group in the upper left corner was never threatened despite the fact that it does not have a base. Such a ponnuki is really worth proverbial 30 points. White keeps sente, however. There is one more forcing move in the top left corner and then care should be taken about the upper right corner where a white komoku faces a high kakari and there is a threat that White will be sealed in this corner as well. So, defense of the upper right corner is the most significant thing now. But the defense should be performed in a way that prevents Black from forming a second wall of the moyo while placing stones close to the stones of the enemy and in sente. When an opponent has a strong outside influence the worst what he can usually do is to turn that influence into territory, by actually building the second wall in gote. This is the situation at the top right now. So, White has several objectives in this corner. The first one is to stay alive, the second one is not to live with two points of territory, the third objective is to get an exit to the center to be able to influence the game with the stones. White 1 is a forcing move. Black has to build two eyes. But White had a better move. The difference is that 1 has more influence on the fight on the rest of the board. The drawback is that it leaves quite a big yose play behind. If Black plays tenuki then a kills. Black 2 takes a critical point and the black group lives as the plays forming a second eye (a and b) are miai. White 3 was planned at 10. It is a natural extension point to get the base for the group on the right. But... White sat there and stared at the position obtained in this corner and felt disgusted. Moreover, a at 10 felt so low and ugly that White took a decision to sacrifice her four stones. There is nothing particularly wrong in the idea of a sacrifice but the sacrifice should be justified by getting something else. White had to at least pretend that she cares about these stones. No, White decided to let them go for nothing. So, White 3 tries to take care of the upper right corner. The objective is to avoid being squeezed. But a low close pincer was perhaps the best decision in this position. It prevented Black from forming a moyo. White a does not feel good. In that case White would keep the corner but Black would get an adequate moyo in return. Black 4 - White 7 is a joseki known to stronger players. Weaker players should remember that White 8 gives a very good shape. The group is almost alive and very stable in the fight. Whatever happens around here, it has a great potential for living. 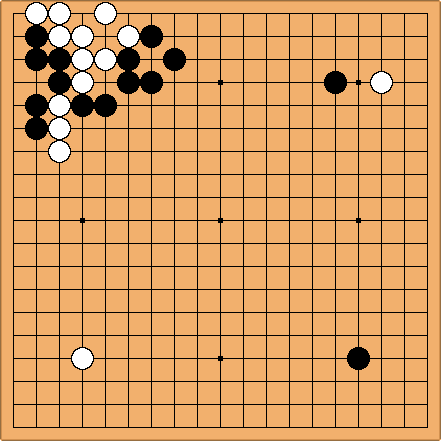 Black 8 is a moyo-forming move. It is gote, though, and thus a little bit easier on White. 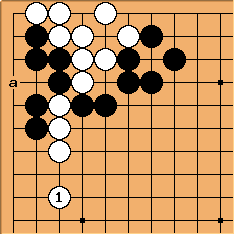 White 9 makes an approach in the lower right corner and Black ignores it to put pressure on the four white stones on the right. Little does he know that White is not going to defend them because of disgust with the result in that corner. I do ask myself, how on earth White managed to win this game?